Last Thursday morning, while the rest of West students were hard at work as usual, I boarded an Airbus A320 and prepared to brave my first flight alone. Destination? Williamstown, Massachusetts, also known as the middle of nowhere. 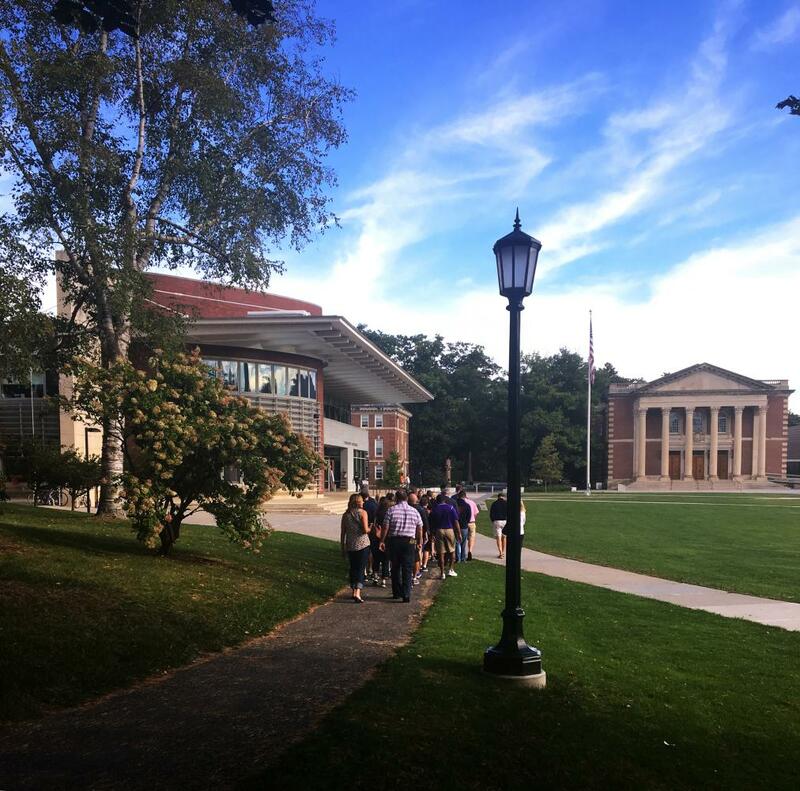 Back in July, I had received a standard, postcard-style mailing from a place called Williams College, a school that I had never heard of and that, to be quite honest, I did not necessarily care to learn about. As a general rule, I open all of my college mail, even though the sheer volume can often render the process repetitive and meaningless. When I quickly scanned over this mailing, however, I saw that it was different — it didn’t advertise any stats, student-faculty ratios, or a meaningless number of total dollars spent on research or financial aid each year. Instead, it offered a three-day, all-expense paid visit to experience the college firsthand. I was skeptical, but in a fit of summer boredom, I took a look at the online application. It didn’t require much besides basic information, an unofficial transcript, and a sample of writing from any English class essay. I don’t know about you, but in my opinion, an essay for a plane ticket is not a bad deal at all. I fixed up one of my in-class essays from GAW, hit submit, and didn’t think about it for about two weeks. Two months after that, I was on the plane. Although I didn’t know it at first, I would be participating in what’s called a fly-in program, something offered by many liberal arts schools, as well as some research universities. They tend to involve a two-night stay in a dorm with a student host, meals at the school’s dining halls, the opportunity to sit in on actual classes, and full access to any clubs or events going on throughout the day. Fly-in programs are meant to fully immerse prospective students in life at the college, and in my opinion, give an infinitely more valuable view of the school than any afternoon college visit could. They can often be geared towards low-income students or those from underrepresented backgrounds, but this is by no means true of all fly-ins. They can also get pretty selective, depending on the school — the program I attended, Windows on Williams, selected about 200 students for the program, and their acceptance rate was about 16 percent. In my own college search, I had stayed away from schools that were very small or that weren’t well-known for research and other opportunities. Two nights before the flight, I did a bit of research on Williams, and was surprised to find that although the average GPA is a 31-34 and it’s ranked as the top liberal arts school in the U.S., I had never heard of Williams. Although I still had my doubts, I decided to approach this school with an open mind. And I’m glad I did, because my time there was like nothing I’ve experienced before. I landed in Albany, New York on Thursday afternoon, and Williams was an hour-long drive away, in the northwest corner of Massachusetts. We drove out of New York and through a bit of Vermont before reaching Massachusetts, and I looked out the window the entire time. I was stunned — I had never seen so many trees before, and as we were about halfway through the drive, I began to see the enormous, tree-covered mountains the college had promised. Sometimes the dense trees would part and give a glimpse of a pond, where the mountains above were reflected perfectly in the clear water. Although I didn’t know what exactly I was expecting, this definitely wasn’t it. From the moment I set foot on campus, I felt both completely welcome and completely immersed in the lives of Williams students. There was a welcome dinner the first night, where I was assigned a table that had about eight students. They came from places ranging from California to New York to Alabama, and one girl was from New Zealand. Also sitting with us was a Williams student ambassador, originally from Atlanta, who told us all about his experience at Williams. He talked about everything from his involvement in dance and the Black Student Union to bringing his own spices to lunch to add to the plainer New England food he never got used to. The second day, among other activities, was dedicated to attending classes with Williams students. We were given a list with over a hundred to choose from and were let loose. As anyone else would do, I started off at a math course called Applied Real Analysis, which was taught by a professor named Mihai Stoiciu. He filled the room with his voice and his lively explanations, and although half of the material went right over my head, the lesson was engaging. After the class ended, I was able to ask him about his own career (he received his Ph.D in Mathematics from Caltech!) and about some of the opportunities Williams has to offer for his field. Although the majority of the time was left open for us to explore and experience Williams on our own, there were a few required events to attend. One of these was an admissions and financial aid presentation. Throughout the discussion of unique programs, study abroad, and research opportunities, I was consistently amazed. Williams is extremely generous when it comes to financial aid: they calculate a separate expected family income than the FAFSA does, taking into account the unique situation of each student’s family, and about 15 percent of Williams students pay absolutely nothing to attend. There are also some amazing programs, including partnerships that allow students the opportunity to study at Oxford University and other institutions. As it’s a college, not a university, there are no graduate students, meaning all research opportunities with professors are available to undergraduate students first and foremost. After the presentation, the dean of admissions and financial aid stuck around to answer questions, as did other admissions officers and several Williams students. I was able to speak with the dean of admissions personally, and she was incredibly funny, down-to-earth, and helpful in answering all of the questions I had. Other aspects and activities of the program were more recreational: among other things, I hand-printed t-shirts and hats with Williams students in the student center, play pool in the lounges, and go on my first-ever hike. We started the hike just as it was getting dark, and at a place where the mountain leveled off, a bonfire was set up, along with a ridiculous amount of marshmallows, chocolate, and graham crackers for making s’mores. Above, there were more stars than you could ever see here, and it was incredible to look down and see the far-off lights of the town below. It was the perfect way to end my last night at the college. Disclaimer: None of the aspects of Williams I mention below are particularly bad, but as this college is pretty different from the medium or large state schools and research universities that students tend to look at more often, there are some additional factors worth considering. As we were driving out to the college from the airport, the signal bars on my phone steadily decreased until I saw the dreaded ‘No Service’ message. This improved a bit when we reached Williamstown, but the school makes sure to inform those with T-Mobile or small carriers that it can be very difficult for them to pick up any signal at all. There is wifi, but throughout my entire stay, I was having issues connecting, with the network kicking me off about every 20 minutes or so and prompting me to re-enter and confirm my email. I’m sure this is not the case for permanent students as this was the guest wifi, but it was a hassle nonetheless. The only other downside I found was the size of the school and the surrounding town. Of course, this depends on your personal preferences, but after the second day, I began to see a lot of the same faces here and there. It’s not a bad thing at all, considering how diverse and interesting Williams students are, but it has an enrollment of about 2,099 students, making it smaller than Niles West. The surrounding town isn’t much bigger, with a population of just under 8,000 (for comparison, Skokie has about 64,270). As Williams students like to say, there’s just one of everything you need in Williamstown — one post office, one pharmacy, one Chinese restaurant. The town was pretty quiet and I felt perfectly safe there. I’m still not sure how I feel about the size, but it’s definitely something to think about when choosing between colleges. The best part about my visit was being able to meet students my age from across the country and from all different backgrounds. I met one who lives on a ranch and helps raise cows and goats in Louisiana, and another who lives in New Mexico less than a mile from the U.S.-Mexico border. There were aspiring statisticians, artists, engineers, and everything in between, and it was eye-opening to hear about lives that were so different from mine. Williams is, without a doubt, an amazing institution, and I would encourage students who are in the application process to give Williams a look, especially if they haven’t been exposed to a similar type of school. Williams provides a great example of what an outstanding liberal arts education looks like, which is often pretty different from what you might get at a public school or research university. For us seniors, it’s not too late to apply for fly-in programs still available at certain colleges and universities. For those who are juniors, though, there are some great opportunities that you should be aware of. Many fly-in programs have application deadlines as early as April or May (don’t worry, I’ll remind you again around that time). I missed the deadline for fly-in programs at a few schools I had really been interested in, simply because I didn’t know these kinds of programs existed. Good luck to all who are in the process of applying for college. Be sure to keep your options open: you never know if the best place for you might be in the heart of a big city or at a tiny school at the base of a mountain.